When Unai Emery arrived as Arsenal manager, it was important to him to have a squad littered with players capable of being captain. The former Sevilla boss cast his eye carefully over his squad and on the eve of the new season he named his five Arsenal captains: Laurent Koscielny, Petr Cech, Aaron Ramsey, Mesut Ozil and Granit Xhaka. But a 3-1 defeat to Manchester City on Sunday exposing a glaring lack of leaders in the Gunners‘ ranks. 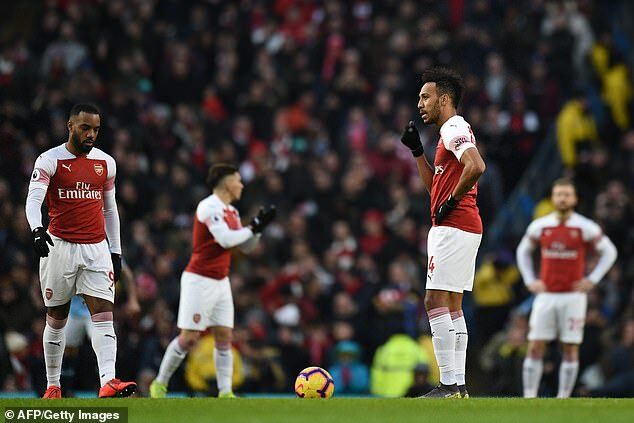 With Ozil not trusted by Emery for big games, Xhaka derided by portions of the fan-base, Koscileny struggling to overcome a constant source of injuries and both Cech and Ramsey nearing exits this summer, Emery’s cluster of captains has failed him. Sportsmail looks at how each of his five captain selections have fared so far this season and whether they have a future with the armband at the Emirates Stadium. The French central defender only returned to the first-team set-up in December after rupturing his Achilles tendon last May. Koscielny was carried off 12 minutes into Arsenal’s Europa League semi-final second leg defeat by Atletico Madrid and took months off to rehabilitate and build up his strength. 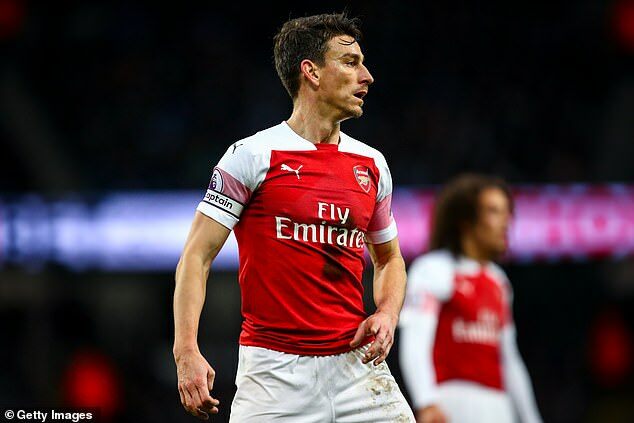 Now 33, Koscielny possesses a wealth of experience both domestically and in Europe and was a certainty to be selected as one of Emery’s picks when it emerged there were to be multiple captains this season. 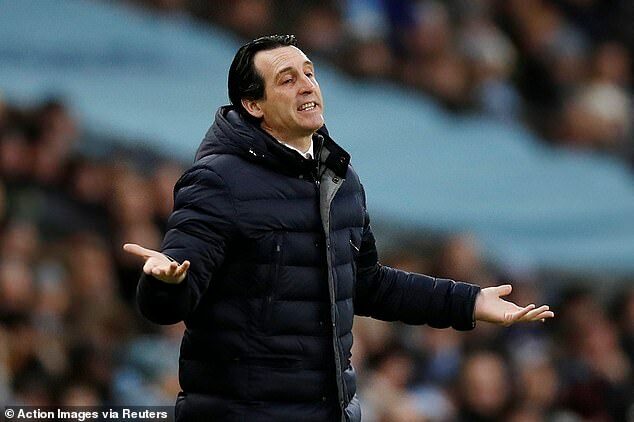 But he is now beginning to show the effects of a long history of injuries and he struggles to provide Emery with a regular presence with which to build a team around. The arrival of Sokratis Papastathopoulos has brought competition in the centre back position along with Shkodran Mustafi and failure to rid himself of regular injury setbacks could see Koscielny given a more reduced role next season. On his way out, Cech is in his final season in an Arsenal shirt. The experienced goalkeeper is a fixture with the captain’s armband whenever he steps onto the pitch, retaining it for 11 of his 13 games across all competitions this season. But the 36-year-old has seen his role with the Gunners significantly reduced since the arrival of German shot-stopper Bernd Leno. 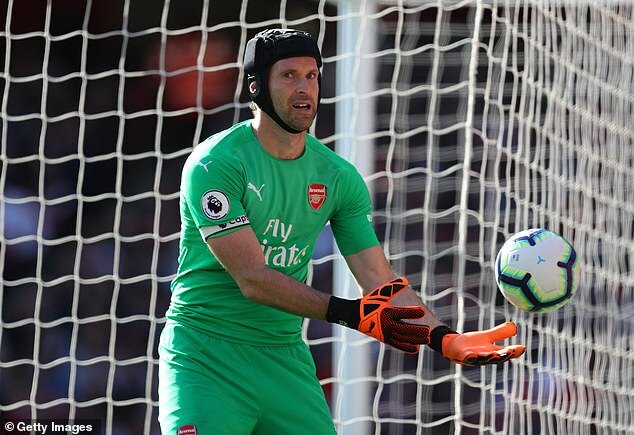 He has enjoyed a rich and successful career in England with both Chelsea and Arsenal and will head into retirement holding the Premier League’s all-time clean sheet record. Cech may not be what he once was but he has been a good professional for Emery in his first season in charge and Arsenal will feel the loss of his experience in the dressing room from next season. Another set for the exit door, Ramsey’s departure on a free in the summer is fast becoming a really strange call. Juventus are keen on the central midfielder who has not let his future impact his performances on the pitch. Unlike Koscielny and Cech, Ramsey has had plenty of game-time under Emery making 30 appearances across all competitions. Handed the armband for three games, including the 5-1 humiliation away against league leaders Liverpool, Ramsey has provided plenty of creative spark. 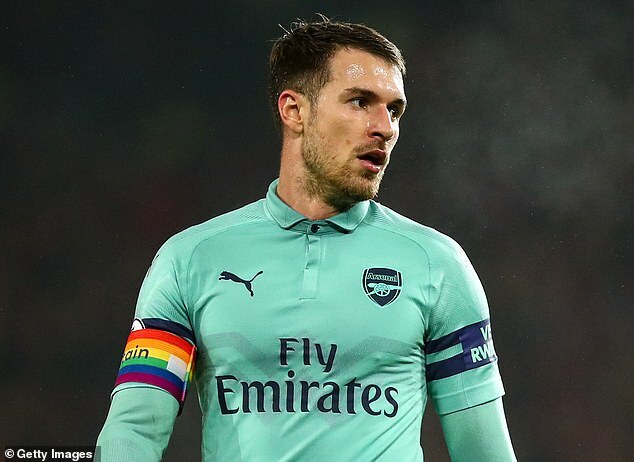 A key link between the midfield and the strikers, Ramsey has looked immense at times this season, particularly away against Fulham where he netted one of his finest goals in an Arsenal shirt. But after a decade in north London his exit is now inevitable and it will allow Emery to bring in new faces and build a side in his image. The German has found life tough under Emery – not least because he has been unable to win his trust for games away from home. 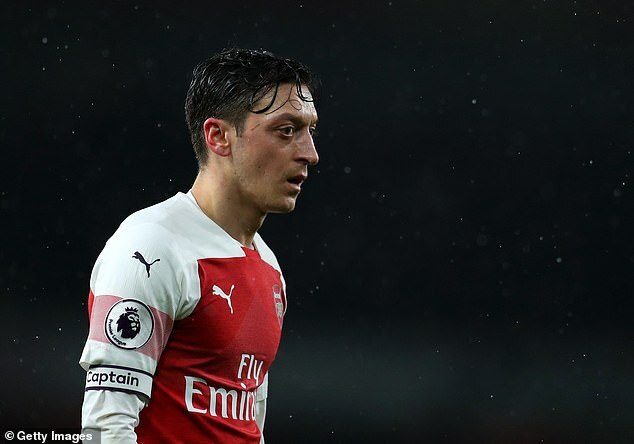 Handed the captain’s armband five times – four at home – Ozil has been seen as a luxury Emery has not been willing to indulge in as he looks to grind out results on the road. It appears Emery would not be immune to the idea of letting Ozil depart like Ramsey but the German’s £350,000-a-week salary is off-putting any potential suitors. Fans have questioned the decision to see Ozil given the responsibility as the captain given the colossal figures such as Tony Adams that wore it over the years. On form, Ozil is the most talented player at Emery’s disposal but a lack of trust and an unwillingness to put individual’s before the team means Ozil is unlikely to be wearing the armband under the Spaniard for much longer. Derided by a number of Arsenal supporters, the Swiss midfielder is well used to criticism. Many suspected that the summer arrival of Lucas Torreira would signal the end for Xhaka as a starting defensive midfielder. But the 26-year-old has continued to get plenty of game-time flanked by Torreira and Matteo Guendouzi. 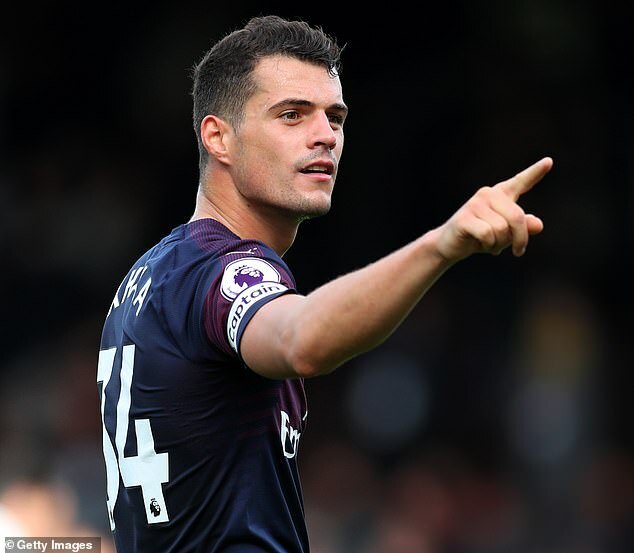 With those two alongside him, Xhaka has seen some of the responsibility lifted from his shoulders but it remains unclear if he is the club’s long-term solution sitting in front of the back four. Four appearances as captain including the 4-2 win over north London rivals Tottenham in December suggests Emery sees value in the former Borussia Monchengladbach midfielder. All eyes will be on whether any clubs make an approach for Xhaka, allowing Torreira to assume the pivotal role shielding the defence. From Keita to Shaqiri… How have Liverpool’s summer signings fared?